INDIANAPOLIS — People leaving their trash and junk in other people's alleys is an ongoing issue around the city. Neighbors between Norwaldo and Kingsley, on the near east side, are starting to get upset. About a dozen tires were dropped in the back of Travis Gilchrest's alley earlier this week. "It’s a mess back there and all these alleys," he said. Gilchrest said people have been treating the alley behind his home like a dumping ground for as long as he can remember. "The city came by and cleaned it up a couple years ago and it was like instantly people started picking up trash for people, and just dumping it in there, back behind our alley," he said. 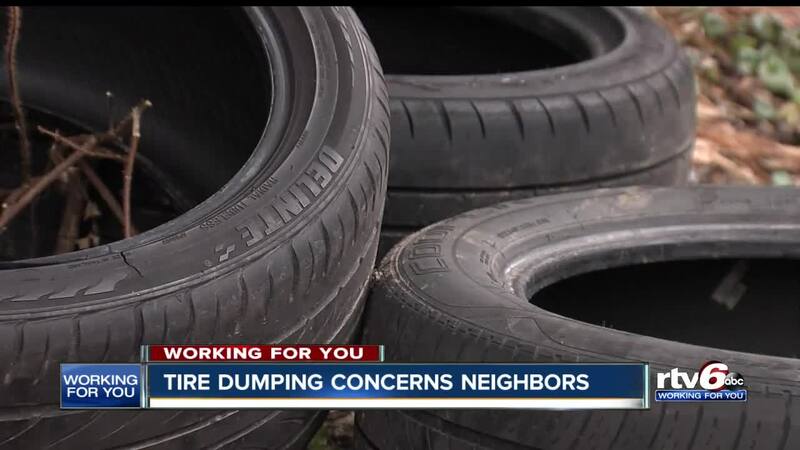 One neighbor, who wished to not be named, said they saw someone in a truck with a trailer dumping the tires out as they drove through. "We like to take care of our neighborhood around here," the neighbor said. "I don’t like it especially when the city came through and tried to clean it up and people just dirty it right back up." So what do you do if someone illegally dumps on your property? The first step is to report it to the Mayors Action Center, so the city can investigate. You could be eligible for the city's illegal dumping and trash abatement program. If you meet certain qualifications the department of business and neighborhood services will help you out with one free clean up of illegal dumping per calendar year. As long as it's less than $2,000 worth of work. Gilchrest says all of the things he has seen in the alley behind his home has caused dangerous problems. "We had to wait like four days to get our power back turned back on," he said. "A transformer blew because there was so much trash back there they couldn’t get the lines reran." For programs that can help you clean up, if some one leaves trash on your property, click here.